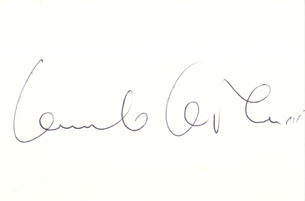 This is a Hand Signed white card 4.5" x 3" by the late Italian Writer and Film Director. He is best known for the Films Last Tango in Paris and The Last Emperor which won all 9 Academy Awards for which it was nominated. Bernardo Bertolucci ( 16 March 1941 – 26 November 2018) was an Italian director and screenwriter, whose films include The Conformist, Last Tango in Paris, 1900, The Last Emperor (for which he won the Academy Award for Best Director and the Academy Award for Best Adapted Screenplay), The Sheltering Sky, Little Buddha, Stealing Beauty and The Dreamers. In recognition of his work, he was presented with the inaugural Honorary Palme d'Or Award at the opening ceremony of the 2011 Cannes Film Festival. From 1979 until his death in 2018, he was married to screenwriter Clare Peploe.